Here is a Straits Settlements Queen Victoria 1/2 cent coins price value with complete years as a reference for everyone. Most collectors only had half cent coins for the year 1872H, 1884 and 1889. The proof coins are almost impossible to get because of lower mintage and high price. 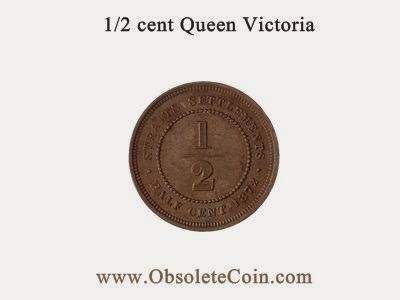 1/2 cent Queen Victoria for year 1883 is also one of the coins that is very hard to find. The coin struck in copper from 1872 until 1883 and change to bronze from 1884 until 1901. Obverse: Head of the Queen wearing coronet or diadem ornamented with jewels facing left; around, VICTORIA QUEEN. The ends of the coronet are connected by a band which is partly hidden by the hair. The hair is drawn into a knot tied with a bow which hangs down the back of the neck. Reverse: Within a circle of beads, 1/2; around above, STRAITS SETTLEMENTS; below, HALF CENT and year. Mint: (H) Heaton and Son, Great Britain. Here is a Straits Settlements Queen Victoria 1/4 cent coins price value with complete years as a reference for everyone. The proof coins are almost impossible to get because the price are very high and I never saw any of the proof in this list. 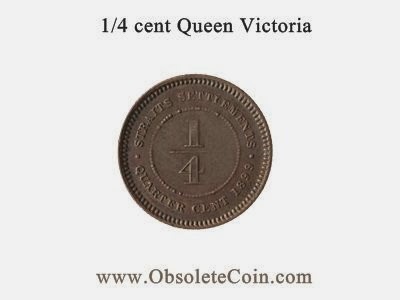 1/4 cent Queen Victoria for year 1883 is also one of the coins that is very hard to find. Complete set for this coin is a little bit hard to achieved but with a hardwork and determination, I do think everyone can get them. The coin struck in copper from 1872 until 1883 and change to bronze from 1884 until 1901. Reverse: Within a circle of beads, 1/4; around above, STRAITS SETTLEMENTS; below, QUARTER CENT and year. The government of the Straits Settlements was acquired by the British Secretary of State from the East India Company on 1958 to control coins issued through the Accountant General to the Government of India. In 1862, The Calcutta Mint was asked to strike a new copper coins. The 1862 coins were of the same size and weight of the previous issue and the same portrait of Queen Victoria was on the obverse. The new coin reverse was redesigned, in the previous issue the coin show the fixed date of 1845 and the name "East India Company". The reverse now has the myrtle wreath against the rim and within the wreath the words ONE CENT INDIA STRAITS 1862 on seperate lines. The words CENT and INDIA are underlined in their central portion. The one is replaced by HALF and 1/4 for the lower denominations. "India Straits" reflecting the Straits Settlements control is via India. Again, in accordance with the 1835 ruling, which ordained that the date on the coins reflect the date of introduction of a new design, the date 1862 appeared on all coins struck for the Straits Settlements between 1862 and 1867 when it became an independent Crown Colony. The quarter cent is the most difficult of all to find, especially in top grades. These copper coins had a limited legal tender up to $1.